Regular maintenance is essential to not only comply with the vehicle's warranty, but also for good vehicle health well after the warranty has expired. 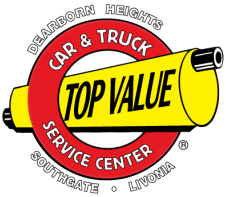 We're generally known for Mufflers and Brakes, but at Top Value we offer so much more. We will replace your engine oil with dependable oil and filters at the optimal 3000-mile interval. At the same time, we will lube your vehicle's chassis according to your vehicle's specifications. These facts alone show that if the oil in your car is contaminated, there are 15,000 chances every 3,000 miles to damage your car!